Each Thanksgiving I like to keep the menu mostly the same, but change up a couple things so the meal always feels comforting while also leaving some room for creativity and anticipation for the new. This past year I decided it was the green vegetable's turn to make the switch from my standard green bean casserole to something different. Not quite sure what to make, I asked my sister, who said both her and my Dad were quite fond of both brussels sprout and broccoli. I wasn't a hundred percent clear if those were meant to be considered separately, but I decided to do a combo of both hearty veggies that have similar roasting times, and paired them with a Spanish chorizo that I was hoping would add some heat along with its meatiness. I got the later out of the sausage, but no real spice, which left the side lacking in my opinion, so I decided to give spicy roasted brussels and broccoli another shot, and this time I ended up with what I was previously hoping for. 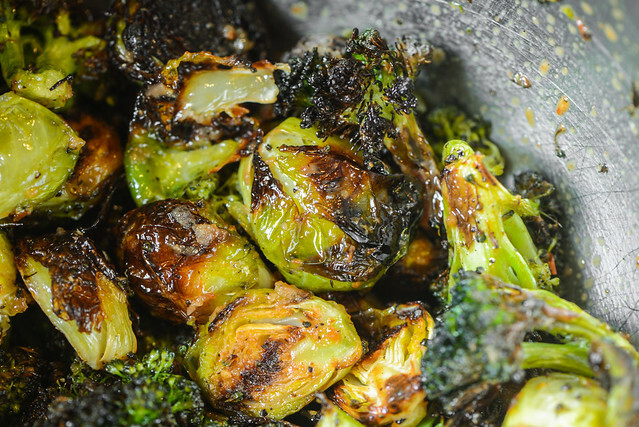 Most of my past grilled brussels recipes called for boiling the sprouts first and then using the grill to get some browning and crispness to them. This is mainly to make them a quick cook, but I didn't have that need for speed this time around, and wanting a full on roasted flavor, I didn't do any par-boiling. 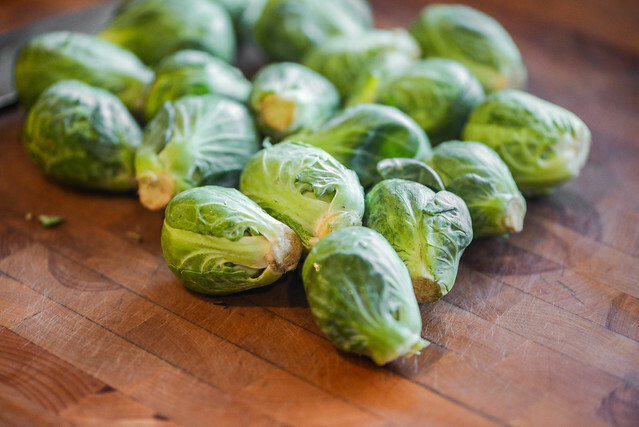 I just started out with some nice sized specimens—larger are better here because smaller brussels sprouts are more prone to falling between the grates—and trimmed and halved them. For the broccoli, I cut up one head into relatively-large florets and then combined them with the sprouts in a large bowl. I then added enough oil to evenly coat everything and gave the vegetables a good seasoning of salt and pepper. Since roasting was my plan, I arranged a chimney of freshly lit coals on one side of the charcoal grate, leaving the other side empty. 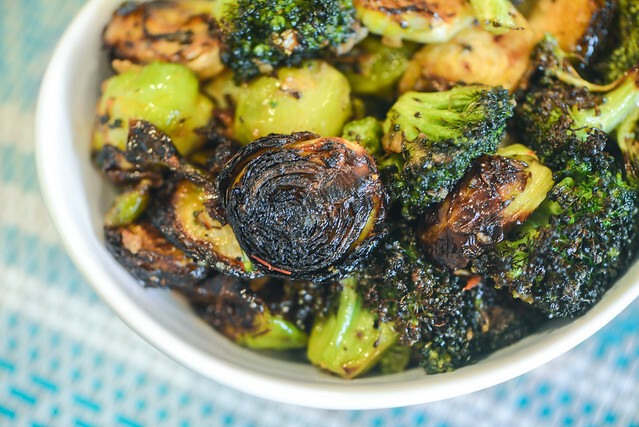 I then situated all of the brussels and broccoli on the cool side of the grill, covered, and went back inside to make the sauce, knowing I should have ample time since both of these veggies are best with longer roasting times, in my opinion. 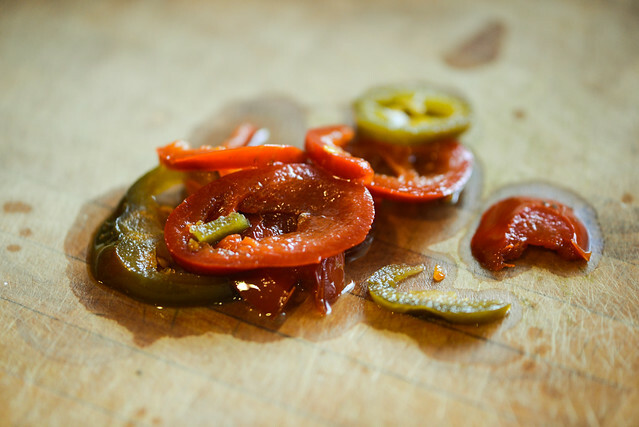 For some reason I really had my heart set on Calabrian chilis for this recipe—I think it was rooted more in being able use the name in the title of the post than any distinctly tangible flavor consideration beside a real kick of heat. I couldn't find those Italian chilis at any store around me though, so I settled on using some hot cherry peppers I had at home, already knowing those jarred ones were definitely spicy enough to get the job done right. This application seemed like it was the perfect time to bust out my under utilized mortar and pestle. I wanted to both turn the peppers into a paste and pulverize them as much as possible to release their maximum heat potential. It was easy work doing this in mortar and pestle, and while I was at it, I mashed in some shallots as well. What resulted was damn spicy paste, but it was a little funky tasting too. To round out the flavor, I started adding in additional ingredients until the sauce tasted right. I began with a splash of sherry vinegar to bring some acidity to the party. Next I whisked in a small spoonful of Dijon mustard, which emulsified the sauce better while adding another heat component. Finally, a little sugar was the final piece of the puzzle, taking some of the edge off the sauce's harshness without making it lose its punch. I was expecting the veggies to take about 30 minutes or so to roast, since it takes just a little longer than that in an oven that's not quite as hot as my grill was. I went back outside to see how everything was doing somewhere between 15 and 20 minutes into the cook and almost all the veggies were perfectly roasted with a softened interior that had nice browning and crispness on the outside. So I transferred the brussels sprouts and broccoli back into the large bowl right away, added in the sauce, and tossed to combine. I then plated them, took some shots, and dug in. These looked pretty unassuming with their standard roasted appearance, but the flavor they had was intense and incredible. 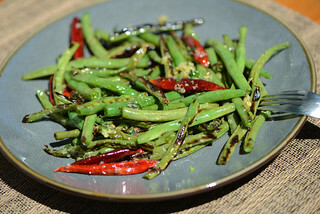 In the first few bites, the taste of the vegetables was what was most noticeable, with a little background tanginess and heat mixed in. 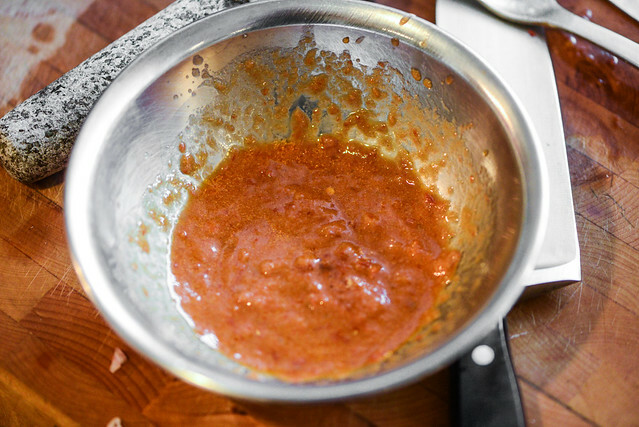 But the sauce became more and more pronounced the further I got into my serving, building up to the full complexity and spiciness I experienced when making it, combining with the mellow bitterness of the brussels sprouts and broccoli to make a really full flavored and exciting side. 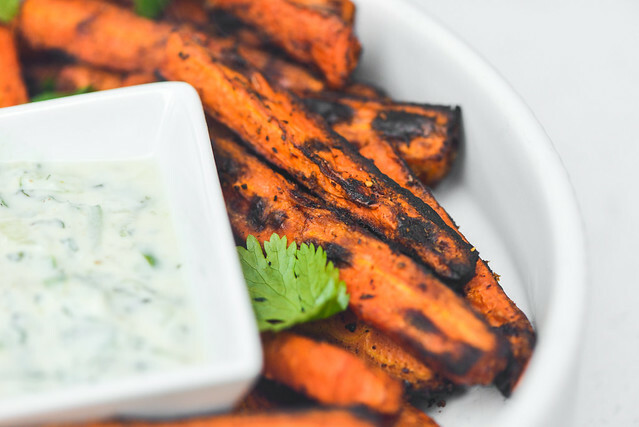 I only wished I had done some experimenting before my last Thanksgiving because this recipe blew my last one out of the water and I think would have made for something people would look forward to year after year. 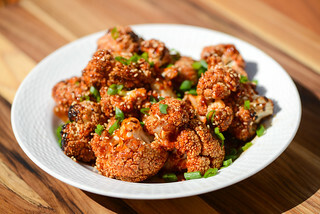 A multi-layered spicy sauce mixes with the slight bitterness and excellent texture of grilled brussels sprouts and broccoli to create a really memorable side. 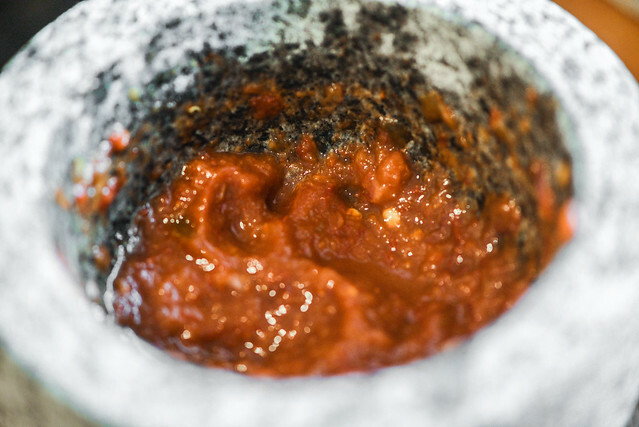 To make the sauce: Place peppers and shallots in a mortar and pestle and work into a smooth paste. Transfer mixture to a small bowl, add in vinegar, mustard, and sugar, and whisk until thoroughly combined. Season sauce with salt to taste. Set aside. Light one chimney full of charcoal. When all the charcoal is lit and covered with gray ash, pour out and arrange the coals on one side of the charcoal grate. Set cooking grate in place, cover grill and allow to preheat for 5 minutes. Clean and oil the grilling grate. 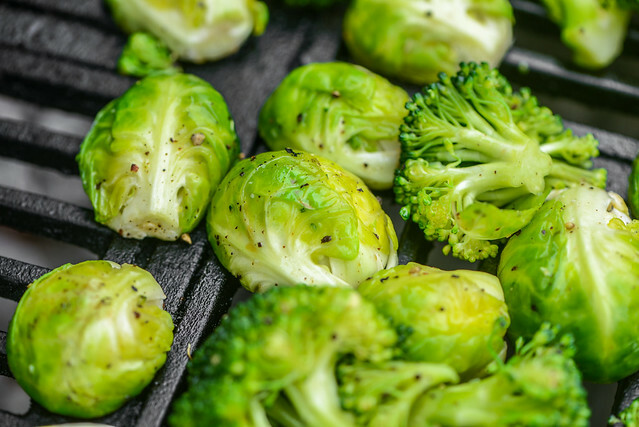 Place brussels sprouts and broccoli in a large bowl and toss with oil, salt, and pepper until thoroughly coated and evenly seasoned. 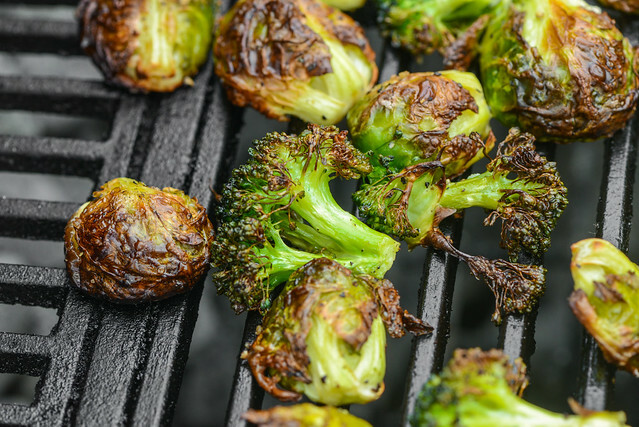 Place brussels sprouts and broccoli on cool side of grill, cover, and roast until both are well browned and are crisp-tender, 15-20 minutes. 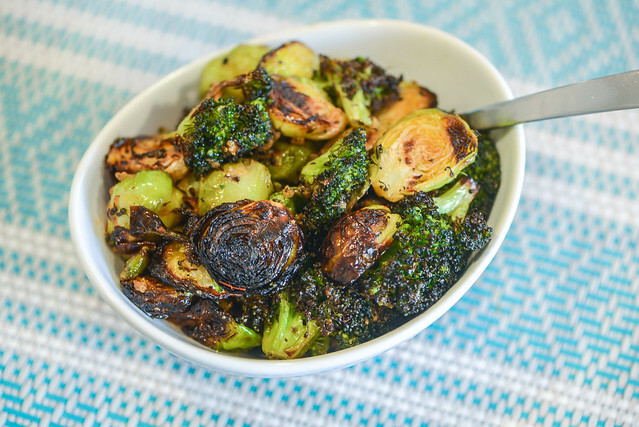 Transfer brussels sprouts and broccoli back to large bowl, add in sauce, and toss to combine. Season with additional salt and pepper to taste. 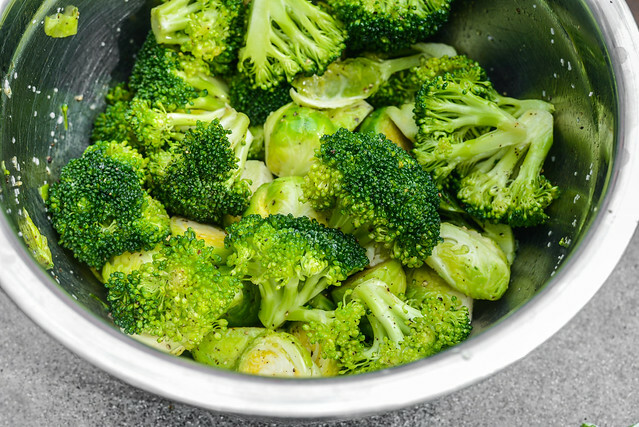 Transfer brussels sprouts and broccoli to a serving dish and serve immediately.